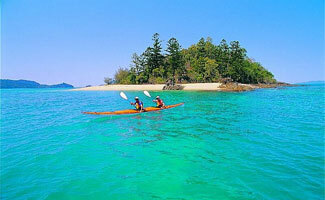 Home General Book yourself onto a sea kayaking trip to the Whitsundays! 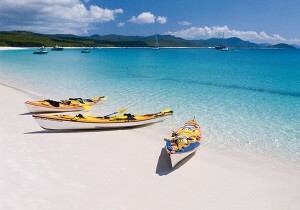 Book yourself onto a sea kayaking trip to the Whitsundays! The Queensland Sea Kayaking Club has organised an extensive ten day trip circumnavigating Whitsunday and Hook Islands from 4 to 14 July 2015. The group will drive up to Airlie Beach on either Friday night 13 July, or early Saturday morning. Accommodation has been booked for Saturday night. On Sunday the barge will take you to Henning Island and from there you will paddle to Whitehaven Beach via Soway Passage for two nights. From this base camp you will explore Hill Inlet and Haslewood Island. Other stopovers include: Cairns Beach on Whitsunday Island, snorkeling at Maureen Cover on Hook Island, Langords Reef for snorkling, exploring the Cid Harbour at Joes Camp on the western side of Whitsunday Island and finally paddlng back to Shute Harbour. All camp sites are booked and paid for and have toilets. You can join the trip if you are a member of any Queensland Canoeing affiliated club. This is a grade 2 trip. However if there are skills that you believe that you need to acquire prior to the trip please contact John (details below). In addition if you don’t have all the required camping equipment or lack extended camping skills please call me as this can easily be resolved. For more details contact John Simmons on 0409896700. Registrations close 14 June 2015. Photo credits: Kayaks, Whitsunday Ngaro Sea Trail. Photo: Justin Heitman. Previous article'WHAT A RACE!!' Another successful year for the Gregory River Canoe Marathon! Next articleTim Stenlake Winner of the 2015 Coomera Cup!